If one hull is fast, then two must be faster–and they are! The Fleet42 all-makes catamaran club has merged with the Arizona Yacht Club and has brought a fleet that includes Hobie, NACRA, Prindle, SolCat, BiMare and other makes. As part of AYC, the cats participate in all events as well as organize unique catamaran sailing, training and pure fun. 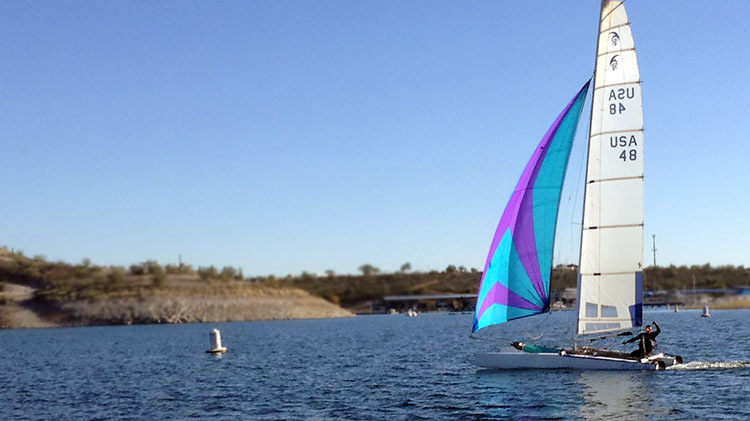 2015 Governor’s Cup winner Jim Tomes on his F18HT catamaran.